What others say about chiropractic care can help you make the right health care choice. Review a selection of Port Arthur Chiropractic Centre patient testimonials below and please email me or contact the office if you have any questions. 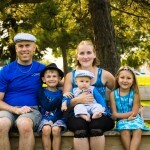 The Bergman Family: Leif, Crystal, Ethan, Aria and Elliot. I have seen Dr. James now through three pregnancies, and with all three, the regular adjustments helped to control and alleviate some of the back and leg pain that came with pregnancy. He continued to see me through the recovery of a c-section and two natural births. Our first child was born 6 and a half weeks premature and in the breech position. We started bringing him to see Dr. James at around 2 months old to assess his mobility and maintain healthy growth and development. We also started around the same age with our daughter for the same reasons. As all children bump and fall as they are learning to move about on their own we feel regular adjustments helped them to maintain good growth and development. Our third child started seeing Dr. James for some mobility issues. He was having hard time turning his head to the left side and was starting to have some trouble with constipation. He was around 4 months old at the time. Within the first two adjustments, he was able to easily move his neck and head again. We continue to see Dr. James regularly for his tummy troubles and it continues to help. He still has trouble, but the length of time he goes without voiding has lessened. Just as diet and exercise can improve your quality of life, so can regular Chiropractic Care. “Due to the controversy that surrounds chiropractic care, I was skeptical of treatment. However, I was deeply concerned about the pain I was experiencing in my lower back. Every day it seemed to get worse. I watched my mom suffer with back pain for years after a lower lumbar injury at work. It ended her career and left her permanently disabled. The thought of living with chronic back pain at times had me depressed. I also suffered terrible anxiety, insomnia, and was lethargic. I knew I had to do something because my life depended on it! I shared my concerns with a trusted friend and unbeknownst to me, she was also suffering from chronic back pain after childbirth. She was seeing a chiropractor and had found great relief after adjustments. She demanded that I see someone, and soon. After doing some research, I contacted The Port Arthur Chiropractor Center the following day. This is where my story begins! Please take a few minutes and allow me to share with you my experience with chiropractic care, specifically with Dr. James DiGiuseppe of Thunder Bay, ON. My chiropractor thoroughly examined me and took x-rays. He explained the problem and was upfront and clear about what he could do to help me. We immediately started a treatment plan, and before any adjustments, we set performance goals. Performance goals were a major key to my chiropractic success! I made some lifestyle changes including exercise and diet. More importantly, I kept track of all my appointments and follow-up appointments. Within a few weeks, not only did my back pain seize, my overall health improved greatly. I felt more energetic, my posture improved, my sinuses were clear, my entire core felt stronger and healthier. I felt lighter. My body changed immediately with each adjustment each week. It was almost like a miracle! You can feel your injury and the entire body beginning to heal itself. I was no longer dependent on over-the-counter pain killers. I have my life back! Chiropractic care has changed my life. I am truly grateful for Dr. James and his staff for their services. My only regret is that I did not do it sooner. My mom, after years of improper treatment now sees a chiropractor and has found great improvement. Let go of the skepticism, let go of the fear, and trust yourself. Trust that you have the ability to find a great doctor like millions of other people have already done. You owe it to yourself, you owe it to your body. It depends on you to have the ability to take care of it. 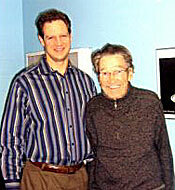 Dr. DiGiuseppe and Bill Davidson. “The changes in Dalainee, who is now 4, are evident in the fact that we haven’t visited the doctor for an illness since the summer of 2008. She gets her hearing tested every 6 months, and on our last visit in the spring of 2009 she tested low normal, the best result we have had yet. The fluid build up in her ears has diminished and is no longer keeping her ears inflamed all the time, so the tubes are better able to do their job, and her nose doesn’t run anymore. Daytona, 7 years old now, hasn’t had a headache in months and is definitely in better control of her body. Both girls attend school and daycare, and rarely get sick, not even with the common cold. I have definitely seen improvements in their health, but even better, they are happier kids now that their bodies are properly aligned. If you want to find out if chiropractic care can help you, all Port Arthur Chiropractic Centre at (807) 345-9700.